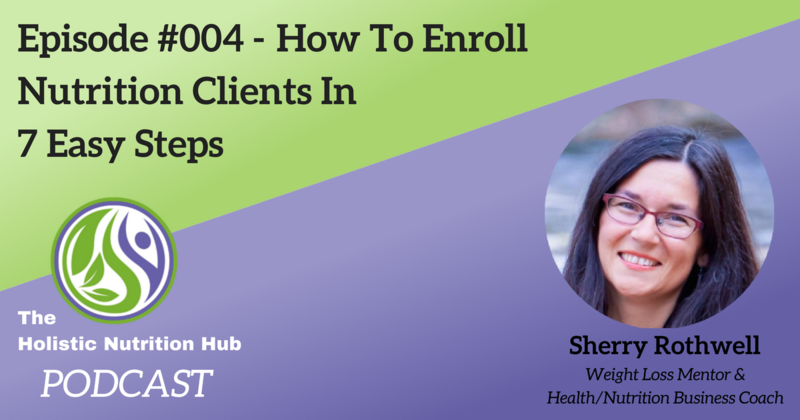 In this week’s episode, I interview Sherry Rothwell, weight loss mentor, and business coach, on how to enroll new nutrition clients in 7 easy steps. Sherry Rothwell is a holistic nutritionist (RHN), weight loss mentor and business coach for holistic nutritionists and health coaches. After healing herself with alternative medicine, Sherry discovered a passion for holistic nutrition. Since then, Sherry has been working in the natural health field (20 plus years!) – from managing health food stores, ‘doula’ ing, owning her own holistic natural mom and baby store – to being an instructor at the Canadian School of Natural Nutrition. Sherry believes that helping people truly assume responsibility for their own health rests on being able to translate intellectual knowledge into inspiring and paradigm changing diet, lifestyle and mindset shifts – all systematized to get results inside of situationally specific niched based health programs!